This is a scarce and desirable tourist pocket map of Shanghai China dating from 1956. 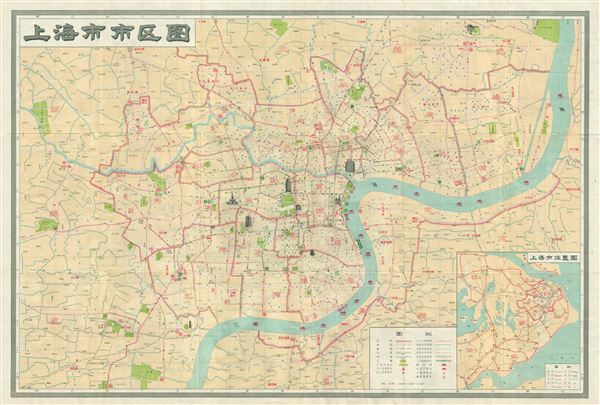 Issued after the Chinese Liberation in 1949 and before the chaotic years of the 'Great Leap Forward' and the 'Cultural Revolution,' this map covers the entire city of Shanghai in considerable detail with important buildings (including the Peace Hotel) shown in profile. Streets, districts, trams, railways, and ferries are also identified. An inset in the lower right quadrant details the Greater Shanghai area. This map was compiled by the China Map Publication Company and published by Chunghwa Books of Shanghai. All text is in Chinese. Very good. Some wear along original fold lines. Chinese text on verso.